Google finally announced Google+, its next effort in social. Any product made by Google will of course emphasize search. However, If you want to search Google Plus contents and profiles, you must have a Google+ account then you can directly search in plus.google.com, or add a complicated code to search box in Google.com. I just developed a new site Google Plus Search to search Google+ posts and profiles by one click, it's very easy and useful. If you have any suggestions, please leave your comment here. You can also follow my Google+ to see updates. After adding http://googleplussearch.chromefans.org/?search=%s as a custom search engine in Chrome when I try to use it I get ZERO search results. Its like I never searched for anything. This is both street smart and ineltligent. 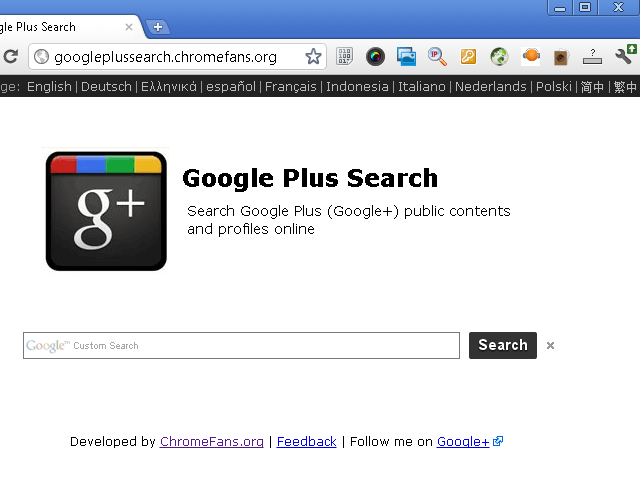 nice article, i like google plus search. Este yo pito esto porque quiero el multi jugador gracias.